At times, my knitting queue feels like a marathon; I have what seems like an endless number of projects lined up no matter how many I complete. But if I don’t have any projects of immediate importance, it’s almost as if I don’t have anything to work on. Perhaps it’s the journalist in me that makes it nearly impossible to find motivation to work on anything without a deadline. It seems that applies to my knitting as well. If I don’t have a specific project in mind, my needles become idle. In my latest rut, I was in the middle of trying my hand at continental knitting. I figured I could use small projects where gauge wasn’t of utmost importance to practice. I came up with the idea to make bows. These projects became the perfect opportunity to explore some techniques, experiment and do some stash busting. Since they are so small, I had no problem ripping back after making a mistake. At the same time, the minimal investment (in terms of both yarn and time) encouraged me to be daring with color combinations, stitch patterns and even design schematics. Here are the first two of the batch, which I’ve named Mint Chip and Earl Gray. Mint Chip was made by holding two strands of different colors together while knitting. Earl Gray was my practice with a color-changing stitch pattern I found in “Super Stitches Knitting” by Karen Hemingway. 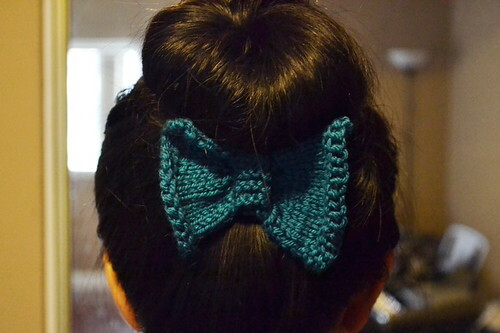 After, I whipped up cute little Maybelle and spent the next day with her peeking out from underneath my top knot. Maybelle may be a single color, but she’s not as simple as she seems. I tried a stitch reduction to produce the true bow shape without using another strip to cinch the base, to make a flatter and easier-to-pin shape. I think they’re adorable (not to mention addictive). 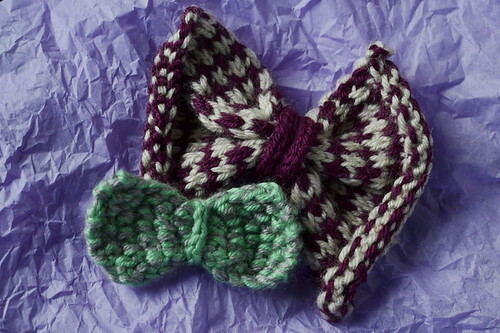 I’ve still got some time before any birthday or holiday calls me away, so I’ll probably keep playing around with bows. These little gals could make for some cute gifts if I ever find myself running short on time to finish a knitting marathon in the future. And I’m sure that time will come again. Share your stories: What do you like to work on when you don’t have any scheduled knitting?